The C18153 performed flawlessly on our trip from NJ to FL. I chose this model because the exhaust on my Ford Flex is right in line with my hitch and the offset allowed my cargo to sit 2-3 inches above the exhaust to avoid any additional heat. The tray also sat far enough out so that I could open my back hatch without any interference of about 24" (height) of cargo. The fold up is a nice feature too. The modifications I made were the addition of a lighting kit from Tractor Supply and I plugged up all openings in the tube steel with duct seal to prevent the invitation of corrosion from the weather we experienced. I also drilled and tapped it for my license plate so that it was visible. I would definitely recommend this carrier. Service was great as well with shipment tracking. Arrived a day earlier than promised. Thank you. This is our second purchase from this company and we could not be more pleased with the items purchased. We first purchased the Draw-Tite Max frame trailer hitch, item #75679. The purchase was simple and the video was of great help when it came to installing. We pulled a U-Haul with our Ford Flex to move our daughter to college and it could not have worked out better. The hitch was solid and we love the way it is tucked out of the way to save on the shins when loading or unloading. We were so pleased, that when we returned, we purchased the fold away cargo carrier that was recommended as well. We have no doubt it will work great to have the extra room available in the car for trips. The shipping on both items were super fast and we highly recommend this company to everyone that is in the market for great quality and service. We look forward to passing along to our friends and family high recommendations as well. Thank you e-trailer.com. bought the basket, and inno crossbars, and rola flat strap cargo net (59200) all from e trailer in three separate purchases. all were received in good condition. used them on 2014 Ford Flex. Put them on in San Diego, with 6 bags in basket. the cargo net worked very good, but decided to add two straps to make sure, LF to RR, RF to LR. had no issues going to san Francisco, montery, and los angeles traffic both ways. wind noise could be heard at 75 mph, into a 35 mph wind, but was not horrible. drove back to Oklahoma with empty basket, and again no wind noise except for 83 mph and a 30 to 40 mph cross wind. easy assembly, for both basket and bars. As advertised - thank you! This bag held a lot and was fairly easy to mount on my Subaru, even tho I had failed to buy the needed clips. The zipper was hard to use, but very sturdy. However, it leaked!! It was on the back of my car through an all-night soft rain and by the time I arrived an hour away at our location, half of the things inside needed to be dried out somewhat. That was very disappointing. So I will not trust its' rain-worthiness again. Nice products well constructed. fits all my surf and ski stuff. The only cons is getting it to be squared when it is not fully filled.Specially when mixing clothes and ski boos and anything harder I ended up using a PVC box in the inside to give it the from I needed. Great way to carry Ski stuff and other sporting goods. I fully recommend it. just be sure to secure tight. The cargo carrier is very well built and the powder coating make the carrier look real nice , very easy to assemble. Got it just in time for my 500 mile road trip. Still looks great after a year. Would still recommend to anyone looking for a cargo carrier. Very much appreciated the quick delivery of my order - thank you! My husband assembled the carrier and it seems like a good sturdy product. Unfortunately, a severe illness in the family forced us to cancel our vacation and we have not had an opportunity to use the hitch & carrier yet. We just used the carrier this past week. Worked perfectly and served the purpose. 1 year later - this box is excellent! Mounted on a 2013 Jeep Grand Cherokee with Rhino Rack (PSP) aero bars also bought from etrailer but seemingly no longer available here (they're really good if you can find them elsewhere). Box sturdy, not too noisy, and a breeze to mount and take off unlike some of the less expensive models. Holds a large amount of stuff and is long enough for our skis. Waterproof too - has been through torrential rains and snows. TL;DR - solid buy, recommended! Does what I need. Ready weather right compartment for luggage and great. Very good quality. Great purchase. Very easy to put together and it worked great! Unit assembly was easy. Very happy with purchase. Currently holding 2 five gallon gas cans, 3 dog run fences, 2 outdoor carpets, propane bbq, sewer hose and hose ramp. Really freed up room in the rv closet. Great price. Install it. Forget about it. Drive. Our Yakima ShowCase Rooftop Cargo Box - 20 cu ft arrived well packed. The person delivering the box took it into our garage for us. I had measured carefully to make sure it would fit our Nissan Pathfinder. It fit perfectly with no room to spare. We took it on vacation and it held all that we had hoped. It was easy to install, easy to get into (because it is accessible from either side) and easy to load and unload. We had a different kid of cargo box previously that was smaller and very noisy on the highway. The Yakima was so quiet! We love it! The MaxxTow Wheelchair Carrier. The product is very sturdy, assembled easily. The ramp is quite adequate for the low to the ground Ford Flex hitch height. I ordered this from etrailer and did not have time to receive it at home before leaving on vacation. Thanks to etrailer & UPS for three day shipping I received it at my hotel in Oklahoma, where I assembled it and put it to good use. The only complaint I have for MaxxTow is there were no assembly instructions on line. True, its not very complicated, however a tool list would have been nice to have. It all worked out because the nice maintenance man at the hotel loaned me some tools and 45 minutes later it was assembled and the scooter was loaded and ready to go. The Carrier got a good test of over 2500 miles from Oklahoma to California. 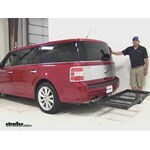 The only issue was going over steep drive ways with the Ford Flex it is low and drags if you don't take it at an angle. A good product for a fair price. My son put this together with no problem. He had it on my car in just a short time. It works perfect with my wheelchair. We are on a 15,000 mile trip and our Rola is all we expected it to be. No problems, leaks or issues .The only negative would be the locks the work ok but seem a bit cheaply made. For the price of the unit it should have better quality locks. Sure solved our storage issues in our Class B Van for this long of a trip. The Rola still is great! I backed into a tree but was able to repair bracket as you cant order a separate bracket Am planning a trip to Alaska this will work great. This is a heavy-duty carrier; it comes in two sections that need to be bolted together and bolted to the 2" shank. Each section is welded together and very stout; I needed to hammer in one of the plate bolts because the alignment was just a bit off. This thing is all steel, meaning it is heavy. I also purchased an anti-rattle bolt/plate which reduces a lot of the flex, though it still moves around. This will be a great addition to the truck when carrying a truck camper. I have only used the cargo box three times since purchasing it about one year ago, but I am very happy with it. It nearly doubles our cargo space, and opens up the Subaru for the occasional guest. On our way up the coast last year, the cargo box was full, and mpg was reduced from 27 to 24 mpg. On the way home, the cargo box was nearly empty, and mpg bumped up to 26 mpg. Of course, some of the reduction from our normal 27 mpg is attributable to added weight, but we only lost 1 mpg due to the cargo box. It is very quiet at freeway speeds, and adds no noticeable roll or sway to the driving. I need to be careful when opening the car's rear hatch since the cargo box does interfere with it. Installing, locking, opening and closing the cargo box is very simple, and I love being able to access luggage from either side of the car. And it keeps the rain out! I plan to strap the cargo box onto our new Subaru Ascent next month and head cross country. Thank-you for an excellent product! Good but could be better... My chief complaint is that it didn't come with reflective tape (I added that later). My other complaint is that the main hitch could fit a little more snug in a standard 2" hitch... Because it isn't a tight fit it allows the carrier to twist from side to side putting unnecessary twisting pressure on the bolts and the weld joints... I would suggest adding a couple of sleeve options to act as shims to snug up the fit to reduce the twist… Otherwise the cargo carrier did a great job..
Today on our 2012 Ford Flex we got the Strong bird Carlson twenty three by sixty cargo carrier. That we're doing a test fit on. This has been designed for use with 500lbs or for use up to 500lbs. They've made it so it goes right into a two inch receiver with no problem. Part number on it is CC-100. Now I like this carrier cause it has a really nice wide holes there on the floor. 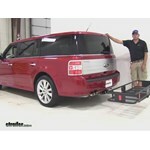 Today on our 2012 Ford Flex we're test fitting the Curt 20x60 folding cargo carrier. They've designed this for 2 inch hitches and it's going to offer a 500 pound weight capacity. Part number on it is C18151. As you can see we've got a nice heavy duty carrier here, it's got the expanded steel type platform in it, or base in it. It gives us plenty of room for that water, dirt, debris and stuff like that to fall right down and out. We've also got a raised edge of about 5-1/2 inches that's going to go all the way around the outside. Not only will that give us good front to back and side to side load stability, but it's also going to offer us some good connection points all the way around there so we can get that load secure. We're going to have about 12-1/4 inches worth of ground clearance there at the very rear. Today on our 2012 Ford Flex. 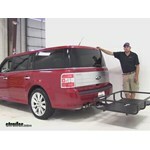 We got the Curt 20X60 folding cargo carrier that we're going to test fit. This has been designed for using 2 inch hitches, offers a 500 pound weight capacity. Part number C18150. As you can see we've got the expanded steel type floor here, plenty of room for that dirt and debris and stuff like that to fold down. Raise the edge here on the side, that's about 5 and a half inches, that's going to give us good load stability. Also the connection points here, all throw a lots of spots first to hook our straps on and make a nice sturdy load or make our load nice and sturdy and secure. Today on our 2012 Ford Flex, we're test fitting the Lets Go Aero GearCage. This is a 32 by 48 cargo carrier. They've designed it for use in 2 inch hitches, and it offers us a 300 pound weight capacity. The part number on it is HCR222. You can see the GearCage, kind of opposed to some of the other carriers, is going to have a nice solid floor, so even real small things, we're not going to have to worry about those passing down and through. We're going to have about a 7 inch raised rail that's going to go all the way around. 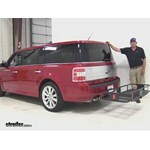 Today on our 2012 Ford Flex we've got the Detail K2 Folding Cargo Carrier that we're test fitting. This is a 20x60 by carrier that's been designed for use in 2" hitches, and it has a 500-pound weight capacity. The part number on it is K2HCC602. Like a lot of carriers, we're going to have that expanded, steel mesh floor here on the bottom, let's all that dirt, debris, water, moisture, stuff like that fall down and out. It's going to give us a nice platform for all of our goods and stuff to ride on. We've got about 5-1/2" worth of ground clearance on our rail that's going to run all the way around that gives us good front-to-back and side-to-side load stability and also offers quite a few connection points around here for our bungees or straps or whatever we plan on securing our load with. You'll notice little movement and a little play in the carrier. 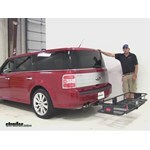 The trailer hitch mounted cargo carrier is an outstanding accessory. It allowed us to bring so much more on vacation. The side rails made securing things really easy and the auxiliary taillight kit plugged right into my plug. The service was so great that I just ordered a trailer hitch cover for the winter. Thanks!